Looking for flowers to make your special day even better for your sweetheart? 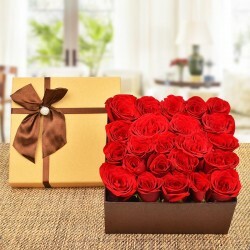 Level up your flower gifting with Roses packed in an elegant box.The crimson-hued, hand-picked red roses are a sure shot way to make your beloved's day. Send Valentine Roses in a Box online and amplify the element of surprise for your beloved on this Valentine's Day. Let your love life blooms with romance, happiness, and laughter this February 14th as you present gorgeous Valentine roses in a box to your beloved. If you want to impress your beloved or crush on Valentine’s Day then, you should present her a romantic gift packed with utmost perfection. MyFlowerTree offers you all a wide variety of roses in a box that resonates love, romance, affection, and admiration in a beautiful way. Valentine’s Day is a special day to celebrate your love life and take it to happy heights where gifts play a crucial role, right? So, make this day special for your beloved by surprising her with our splendid Valentine roses in a box. We provide divine roses in a box that will express your love for your partner without saying anything. We always deliver fresh roses to our customers so that it can put a smile on their face instantly as they unbox it. If you are scrolling for a romantic surprise idea to leave your girlfriend mesmerized on Valentine’s Day then, let us tell you that now you can send roses in a box for Valentine’s Day and say ‘I LOVE YOU’ to your partner in a more romantic way. Just imagine how happy will your girlfriend be on receiving a box of beautiful roses on Valentine’s Day with a love note attached to it. Our ethereal Valentine roses in a box make one of the best Valentine gifts for those who stay miles apart from their partners. Couples who are in a long-distance relationship often face more problems in their love life due to the fact that they stay miles apart from each other. Similarly, on Valentine’s Day, it becomes difficult for them to meet each other. 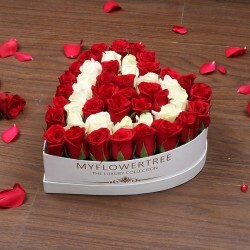 But, no more because now you can send Valentine roses beautifully arranged in a box for your partner across India in just a few clicks from MyFlowerTree. We offer our customers same day Valentine gift delivery option in more than 350+ cities of India and abroad as well. 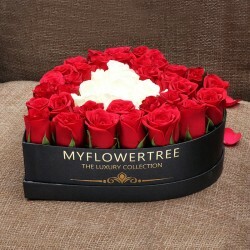 For example, if your girlfriend stays in UK or USA or Canada or Australia and you want to send her roses on Valentine’s Day from India then, all you have to do is to visit myflowertree.com and place your order.